Our beautiful painted, mango and solid oak extendable dining tables bring flexibility to your dining room, enabling you to handle special occasions with ease. If you need an everyday table as well as something with a little more space to dazzle extra guests or simply to cope with big family meals, then our solid extending dining tables can provide the flexibility you need. Available in 3ft, 4ft, 5ft and 6ft, our largest extendable dining tables can comfortably seat up to 12 people when fully extended, and allow plenty of extra space for food, drink, and friends. Styles for our wooden extendable dining tables range from traditional rustic solid oak to natural oak and painted extendable tables, allowing you to find the perfect table to complement your dining areas interior design. Quality always comes first at Oak Furnitureland, which is why each piece of furniture we produce is built using the finest cuts of solid hardwood. Once you’ve picked out your perfect extending dining table, you can choose from our wide selection of beautiful dining chairs. Available in genuine leather, fabric and even woven grass, you can rest assured that you’ll find a style that looks at home in your dining room. 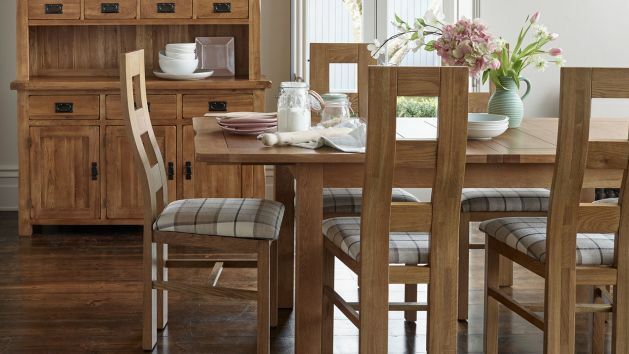 If you need a little inspiration, our dining set builder can help get those creative juices flowing! Or simply browse our sets of extendable dining table and chairs to have your table and chairs combination matched for you whilst saving money. A dining table should be an investment for your home, and by avoiding MDF, chipboard, and other inferior materials, our furniture is designed to last you a lifetime when properly cared for. Keeping your dining table looking as good as new is easier than you might think; it just takes a little bit of TLC from time to time. Try to get into the habit of always using tablecloths, placemats, and coasters – things such as oily food, wine, and coffee can quickly leave stains and marks that are tough to remove. Investing in some furniture wax polish is well worthwhile, as it will help to protect and nourish your dining set, and also enhances the natural beauty of the wood. This can be reapplied every three months to keep your dining table looking pristine. If you’re on a budget, or simply want to make paying for your beautiful new extendable dining table a little easier, our flexible finance options can help. Purchases over £500 can be spread across monthly payments for up to four years, while larger purchases of £3,500 or more allow you to enjoy interest-free credit for up to three years. And remember, every order from Oak Furniture Land qualifies for free home delivery to the room of your choice!